In typical Bose technology fashion, these SoundLink Wireless Headphones deliver compelling music performance with clear real-life sound even when it’s noisy or windy outside. This model switches seamlessly between connected Bluetooth devices and the battery offers up to 15 hours operation. Bose technology offers a better wireless experience with a deep, immersive sound and clearer calls. The Bose TriPort technology and Active EQ delivers a sound that’s unsurpassed at any volume, while the advanced microphone system provides clearer calls even in extremely windy or noisy environments. Switching between two Bluetooth devices is simple too, so for example if you’re watching a movie and a call comes in on your mobile phone, the headphones will automatically pause the video allowing you to answer the call without missing anything, then when the call is ended, the movie will resume automatically. 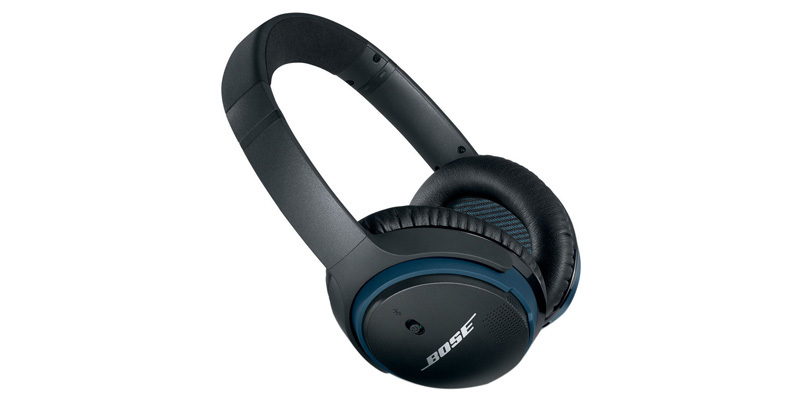 These Bose headphones are also lighter and more comfortable than most comparable wireless headphones on the market, plus they’re made with quality impact-resistant materials so they can stand up to your busy life. The ear cup controls are easy to use to control music and other functions on Apple, Samsung and Android mobile devices, while the the headphones fold completely flat into the matching protective case for easy travel or storage. The deep yet crystal clear sound you can experience from the Bose SoundLink Around-Ear Wireless Headphones really is something else, in fact once you hear them, we think you’ll agree these are the best-sounding wireless headphones you’ll find anywhere today. Music playback is awesome and the audio while watching movies on tablet devices is simply incredible. Add in clear call quality at both ends even in windy or noisy environments, and it’s easy to see why these Around-Ear Wireless Headphones from Bose are highly recommended.